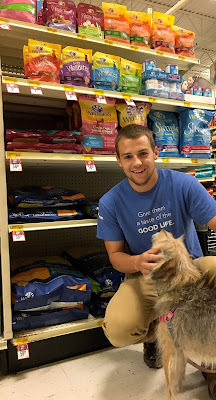 Join The Wellness Recycle Program At #WellnessPet ! 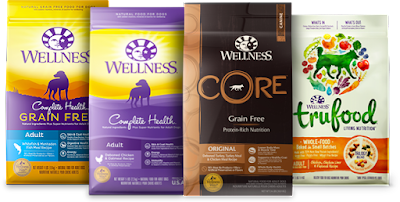 You all know that we've written a few posts recently about Wellness® Pet Food . I've been eating exclusively Wellness® Complete Health®, Grain Free dog food since late September, and have been loving every crunchy morsel I can get my paws on. Unfortunately, Parental Unit doles it out, so I only get a bit less than one cup, twice a day...What's up with the strict rationing? Where are ya hidin' my Wellness, Parental Unit? We're pleased to report that I am as trim as ever and seem to have increased energy and vitality-that's what's known as The Wellness Difference! And you human parental units can see these signs of true pet health for yourself! 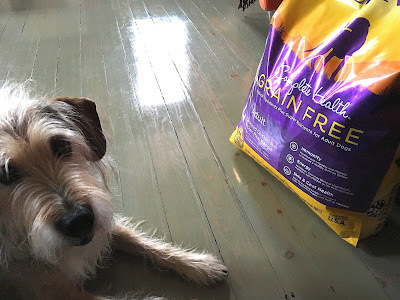 You know, I have occasionally turned my nose up at some pet foods Parental Unit has serve me, but I can assure you that I've scarfed down my Wellness Complete Health Grain Free dog food each time I dine. Wellness Complete Health features high quality protein as the first ingredient, plus grain free carbs, select fats, and nutrient-rich fruits and vegetables that provide the energy and nutrition our pets need...to not just hang out on the couch, but to thrive! Don't forget that you can purchase the entire line of Wellness pet food at everyone's favorite, one stop shop for their furry family members: PetSmart! And you can make new friends there, too! Wellness Takes Action On Behalf Of The Environment! This week, we're excited to share with you some important information about the Wellness Recycling program. It's one thing to talk about being "environmentally friendly", but it really makes a difference when a company puts its actions behind those words. Wellness has done just that by embracing and supporting recyling for its product packaging. In fact, they are the very first U.S.-based pet food company to partner with TerraCycle®, a leader in both upcycle and recycle efforts. According to the TerraCycle® website, "...they are able to divert millions of pounds of waste from landfills and incinerators each month." And according to Parental Unit, this directly translates into much less land, water and air pollution—yes! The Wellness recycling program encourages pet parents, schools and organizations to mail in their empty Wellness pet food packaging for free to earn gifts or cash for their favorite non-profit or school! You can sign up for the Wellness Recycling program through the TerraCycle® website—don't miss this opportunity to help the environment! Wellness® Complete Health®, Wellness® CORE®, and Wellness® TruFood® flexible plastic pet food packaging. You earn points for recycling Wellness Packaging and you can redeem those points for gifts or cash to your favorite school or nonprofit! You mean we can recycle this bag? Hey, the sooner I finish the food, the sooner you can recycle it... right Parental Unit? While you're at it, why not visit Wellness pet food on their social media channels and learn more about their quality food: You can find Wellness on Facebook, Twitter & Instagram. Check 'em out! Emmett's eating Wellness, too, and I LOVE this recycling program! I participate in other TerraCycle recycling programs already, so I was thrilled when Wellness announced this partnership! Can't wait to start mailing in our empty pet food bags!! Oh, we agree, Maggie and Emmett—the Wellness Recycle Program is a great idea! We had not heard of TerraCycle before, but so glad we did—what a cool company! I love that Wellness is participating in this recycling program and that you can earn GCs for a good cause. It's a huge win for everyone! iran tours is a great destination for tourists in the Middle East and in Iran with great facilities and beautiful natural scenery.